Hello Blog Lovers!! 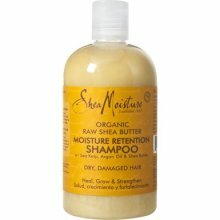 This weeks Hair Product of the Week is the Shea Moisture Raw Shea Butter Moisture Retention Shampoo. I purchased this shampoo about a month ago and I wanted to try it out for a while before I actually posted about it. I just wanted to say first and foremost I love this shampoo!! Out of all the sulfate free shampoos I have tried I must say that this one is my ultimate favorite and I feel it has done wonders for my hair (I will review it more in depth later this week). This shampoo can be found at Target for just $10! It smells great and it’s affordable. It contains No Parabens, No phtalates, No Paraffin, No Gluten, No Propylene Glycol, No Mineral Oil, No Synthetic Fragrance, No PABA No Synthetic color, NO DEA, No Animal Ingredients, and most of all NO SULFATES!! It does however contain some all natural organic ingredients such as Shea Butter, Sea Kelp, and my favorite Argan Oil! It’s purely organic and I have used it every single time I shampoo my hair (since purchasing it) and I love it! I will definitely be repurchasing this product and continuing to use it on my hair. This shampoo alone will hydrate, smooth, and repair strands of the hair and leave it manageable and soft. You can find this product at other retailers such as: Wal-greens and Walmart. The Shea Moisture Line sales also bath, baby, and shaving products for men. Contains de-ionized water, Decyl Glucoside (sugar beets), African Butyrospermum Parkii (Shea butter) (denotes certified organic ingredients), aloe vera leaf juice, Argan Oil, Panthenol (pro-vitamin B-5, rosemary extract, sea kelp extract, vitamin E, Lonicera Caprifolium (honeysuckle) flower and Lonicera Japonica (Japanese honeysuckle) flower extract. P.S. I know I say I love a lot of different products and I do love them all..but for different reasons. I must say that if you haven’t tried this shampoo before you need to go get it today or tomorrow and try it during your next shampoo session your hair will thank you!! This entry was posted on Wednesday, September 14th, 2011 at 4:03 am	and posted in Argan Oil, Damaged hair, Dry hair, File Under Hair Product of the Week, Organic Shampoos, Sea Kelp, Shea Butter, Shea Moisture Moisture Rention Shampoo. You can follow any responses to this entry through the RSS 2.0 feed. « Special Thanks to Visual Luxe! !